I’m currently using a modified and simplified version of the default Freestraction theme along with the custom font, iA Writer Duospace. 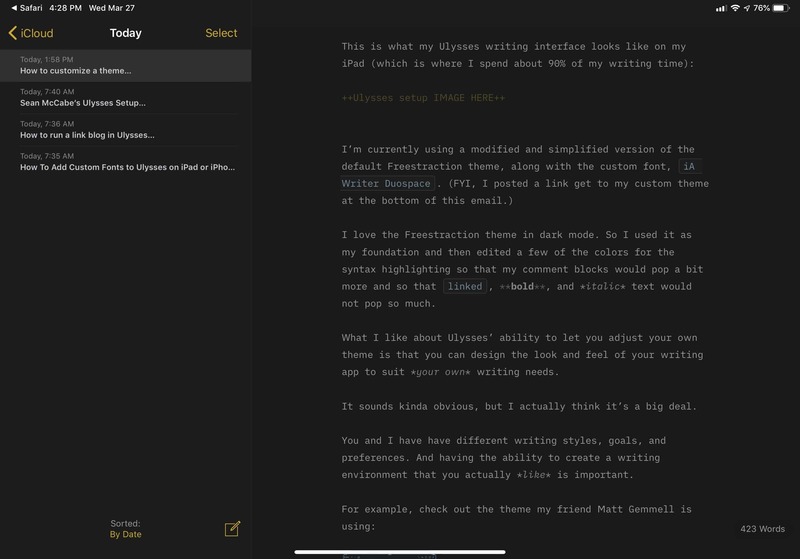 What I like about Ulysses’ ability to let you adjust your own theme is that you can design the look and feel of your writing app to suit your own writing needs and preferences. It sounds kinda obvious, but I actually think it’s a big deal. You and I have have different writing styles, goals, and preferences. And having the ability to create a writing environment that you actually like is important. For me, I want my text formatting to be nearly invisible. Because, when writing, you want to focus on the feel of the text not the think of it (which is the entire point behind why John Gruber created Markdown in the first place). With all that said, today we just posted a quick-start guide that shows you how to find, download, install, and customize your own themes within Ulysses. When you are writing, what is the feel of the text that best helps you to focus and do your best work? If you don’t love the feel of Ulysses, here’s how to change it to suit your mood. Heck, you could even set up a Day Theme and a Night Theme.